This Ultimate Tuna Salad with Olive Dressing comes together in 15 minutes and will change your attitude towards canned tuna forever! 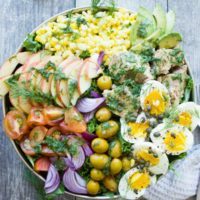 An easy, healthy yet satisfying salad recipe, indefinitely adaptable and perfect for all seasons! Another salad day, and it’s one of my favorite salads of all time. 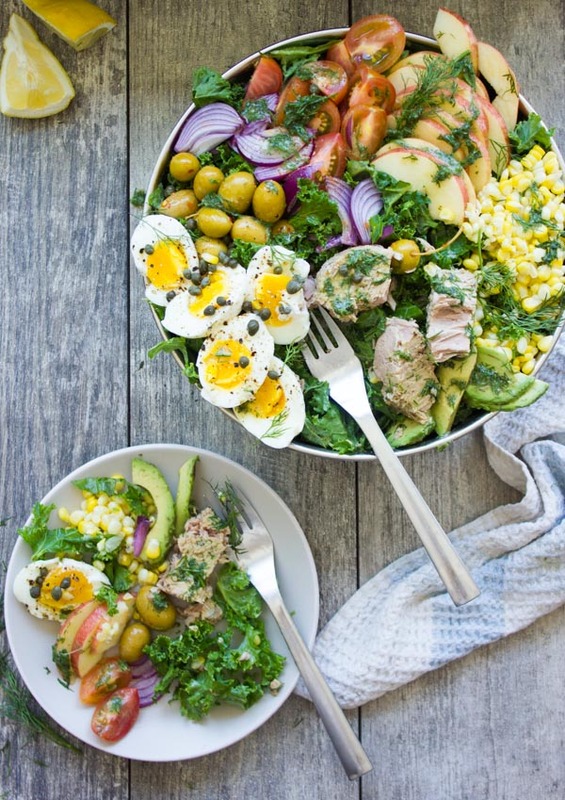 I’m sharing the Ultimate Tuna Salad recipe with a gorgeous Olive Dressing. Believe me, you will never need any other recipe for tuna salad! Really, this is the one and only tuna salad recipe you’ll ever make from now on. Trust me. I took it up a notch by adding a zesty tangy Olive Dressing and it really takes my tuna salad to a whole new level. Did you read my funny tuna story when I posted this awesome spicy chunky tuna sandwich? These sandwiches are seriously so good and they were like my gateway to loving tuna! So this Ultimate Tuna Salad is similar in the sense that it’s not a mayo tuna mush. It’s a chunky flavorful seafood salad with a lot of veg and fruit added to keep things exciting! 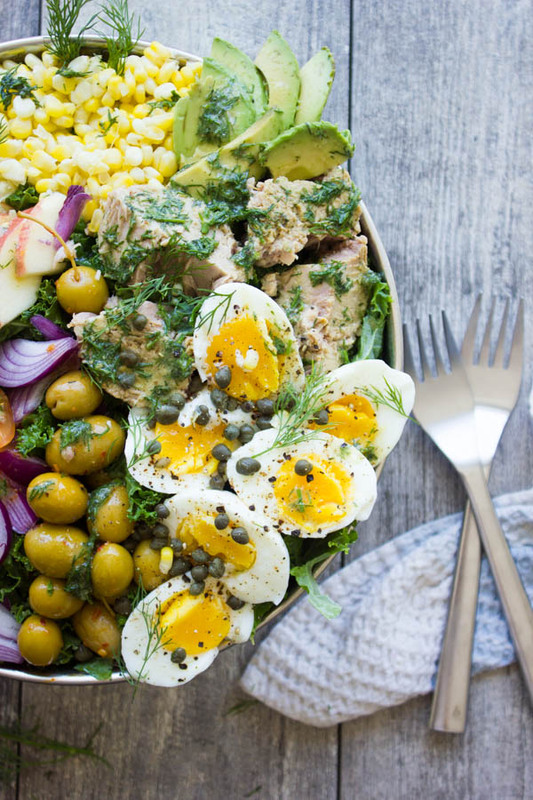 When eating this healthy tuna salad, you actually know, taste and feel that you’re eating real tuna! It makes all the difference! I start off by making a flavor-packed olive dressing to infuse my salad and tuna. It’s a base of finely chopped red or green onions, green olives (the ones packed in red chili and spice are the best! ), grainy honey mustard, capers, lemon juice, minced jalapeños, olives oil, and plenty of herbs! This olive dressing is like MAGIC, pure flavor goodness. I drain my canned tuna and pour a bit of that sauce onto the fish and let it sit for a few minutes to soak it up. While the tuna soaks up some of the olive dressing, I chop all my salad ingredients and toss them with a bit of the olive dressing. I then simply assemble the salad with the tuna and drizzle more of the sauce on top. 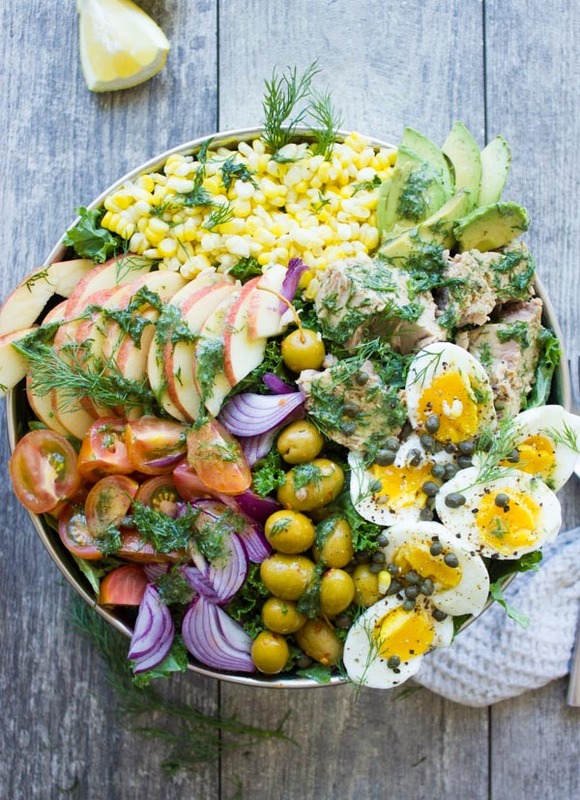 Pure salad love. To me, this Ultimate Tuna Salad is exactly what a really good tuna salad should be. Compare that to your store-bought mush of tuna and mayo with a pinch of salt – I KNOW you’ll be totally hooked. I really hope you try this healthy salad recipe—for me, it was life-changing and I know it will do the same to you! Drain the tuna and drizzle it with a bit of olive dressing to make it extra flavorsome! 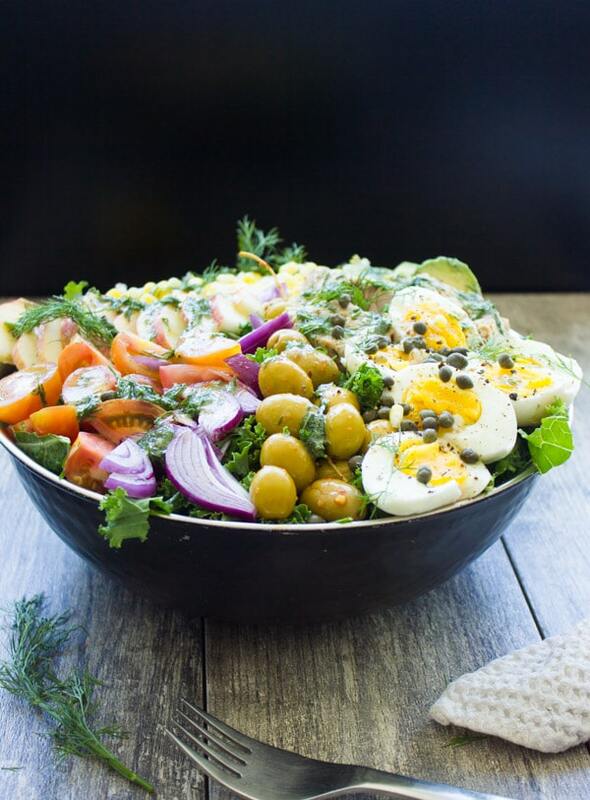 A couple of tablespoons of capers on top of the sliced boiled eggs take them to the next level. For meal prep, chop all the ingredients, mix the tuna with some dressing and store everything in the fridge until ready to assemble. 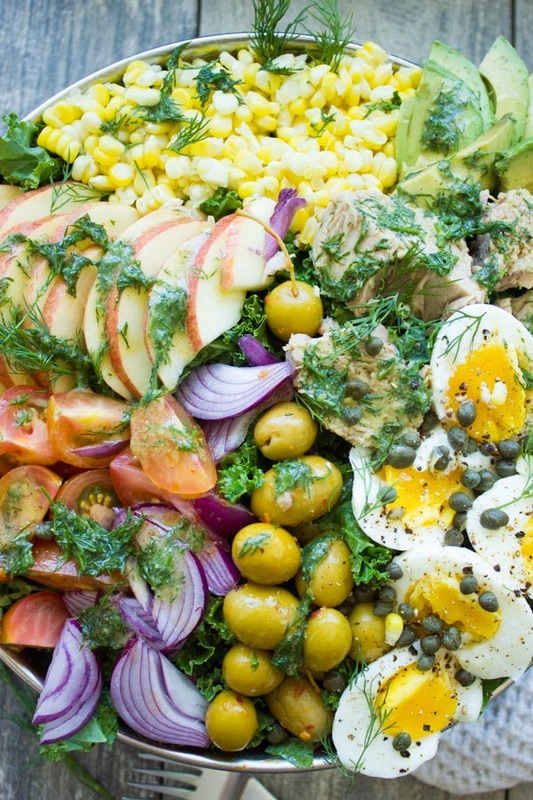 Prepare your salad ingredient and place them in a large bowl. In another bowl, mix all the sauce ingredients until smooth. Taste and adjust the seasoning. Take 2 tablespoons of the sauce and drizzle of the chunks of tuna and set aside. Take another 3 Tablespoons of sauce (more or less to taste) and toss it with the salad ingredients. Arrange the salad ingredients on the plate, I’ve clumped each ingredient separately with the greens at the bottom of the bowl.